Snoremender PS product review – How does it stack up against its competitors? With dozens of products on the market that claim to eliminate snoring, deciphering between which ones actually work and which are the decoys can be an overwhelming challenge. Snoremender PS by Sleep Well Enjoy Life happens to be one of these products and I am going to save you a lot of time by sharing the information that I found on this device in the form of a review. The Snoremender PS is a mandibular advancement device that repositions the lower jaw forward, preventing the soft tissues in the throat from collapsing and causing the snoring sound. 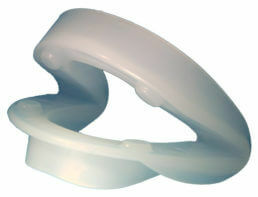 This technique is used by several manufacturers who sell anti-snoring devices and has been around for several years now. Aside from its classification as a MAD, it has several unique features that are rarely found when compared to other product that are available. 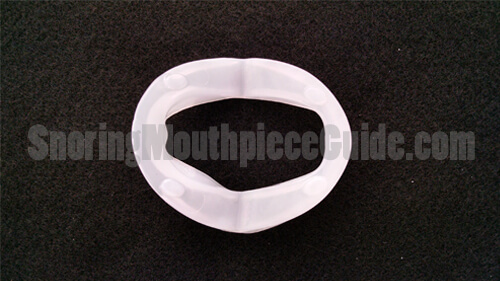 The unique “hinged” design allows you to freely open and close your mouth. The vast majority of others out there hold your mouth in a closed position and sometimes leave small breathing holes. The hinged design is a plus for those who tend to breathe through their mouth while sleeping. This is especially helpful to sinus sufferers who are unable to breathe through their nose. 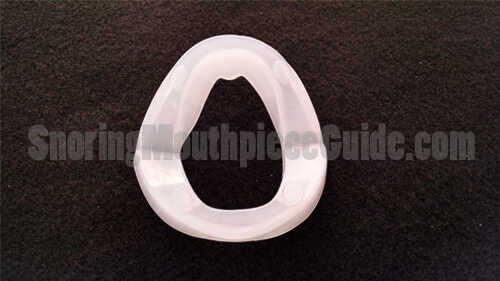 It is the only mouthpiece on the market that addresses the issue of outward pressure on the lower front teeth by refocusing the area in which the device makes contact with the surface of each tooth. Snoremender PS offers simplicity which lessens the chance of product malfunction. More complicated devices are often constructed of fragile components which can break, rendering the mouthpiece unusable. It is constructed of a soft medical grade plastic which is pliable and will not break if dropped. A simple design means that there are fewer crevices for germs and bacteria to hide in. After a quick rub down with your fingers using soap and water, you will be able to reach all areas where these germs may be hiding. With a useful life of 12-24 months, it outlasts several of its competitors. This translates into substantial savings if you plan to use a MAD for several years to come. The Snoremender does offer some degree of adjustability allowing the user to increase or reduce jaw advancement by heating the lower portion of the device. There are a few advantages and disadvantages when it comes to adjusting this style of a mouthpiece. It is not as simple as turning a screw. Comparatively speaking, it’s as easy to adjust as a Somnogard AP although with the Snoremender no special tools are required to make adjustments. Such tools are sometimes misplaced, making further adjustments difficult. The range of adjustment is medium – however, if further adjustment is needed you can switch to a different strength offered by the manufacturer. The company behind the device, Sleep Well Enjoy Life, originated in the UK and in 2011 made its way to the United States. It was originally formed in 2007 and has been led by Jeremy Alan Kenyon ever since. Mr. Kenyon had a background in the computer and gaming industry up until he joined the company in 2007. He attended the University of Cambridge in the UK, receiving a degree in applied mathematics and computing. Mr. Kenyon designed the Snoremender PS with the assistance of a firm of Denmark orthodontists. The team of designers was led by a member of the American Academy of Dental Sleep Medicine (AADSM) who has been practicing for more than 30 years. The AADSM focuses on dental solutions such as oral appliances and upper airway surgery. Having a seasoned industry professional involved in the design process helps to strengthen the credibility of this product. This small company is privately owned and operates with Mr. Kenyon listed as the director and secretary. Their website claims that their device has been “clinically proven”, and they have provided clinical data to support this claim. 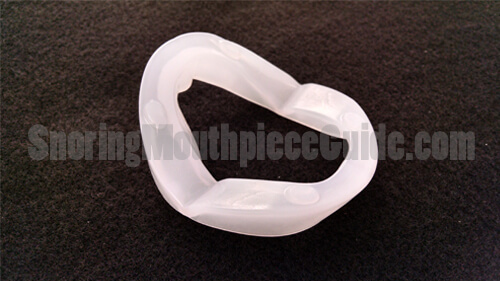 Similar to the Snoremender PS, the Zquiet offers a hinged design that also helps to reduce or eliminate snoring. 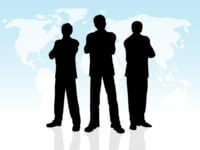 While they share several attributes, there are 3 areas where they differ. 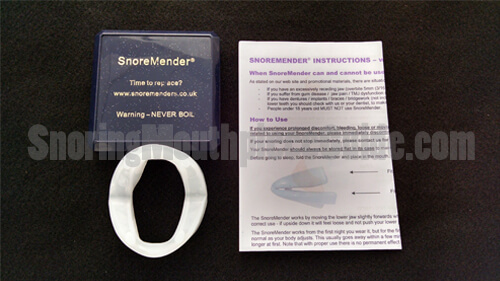 Snoremender PS, although it claims to work “out of the box” can be adjusted by heating the plastic between 150° and 170° in order to stretch and shape the material. This temperature can be easily achieved by mixing 2 cups of boiling water with 1 cup of cold water. The Zquiet does not offer any adjustability although it may be trimmed for a more comfortable fit. While the price points are similar, Snoremender PS does not charge for shipping which makes it about $10 cheaper than its competitor. With the Snoremender PS, you will receive a discount when purchasing in quantity. For instance, if you purchase two you will save $8 on each while purchasing five or more will save $14 on each item. This is especially useful if you are purchasing for yourself and a partner. Remember, while this device will last for several months, it will eventually need to be replaced. The Snoremender PS offers “Pressure Shift Technology” which focuses most of the outward pressure on the larger (and stronger) most inner teeth instead of the smaller front teeth. The Zquiet does not offer this. Over the past week, I have experimented with both the original Snoremender and the Snoremender PS. The Snoremender PS model was recently released (November 2013) and offers several improved features compared to the original. When you order from their website you will receive the new “PS” model although the original device is still available upon request. I happened to discover the Snoremender PS shortly after its introduction and it turns out that I was the first to do a review comparing both the new and original devices. I share my entire experience using both devices in the video below. The original Snoremender was released in 2007 and in November of 2013, the improved “PS” model was released. In case you are wondering, PS in an acronym for “pressure shift”. Keep on reading and I will further explain. I’ll start by comparing the two by pointing out the differences and similarities that I noticed. Thickness of material. One of the first things that I noticed was that the PS model has walls which are much thicker than the original model. The type of material used seems to have remained the same between the two. The increased thickness of the material gave an overall appearance of a higher quality product. Hinge tension. The tension of the hinges was a bit stronger with the newer PS model. I believe that this was due to the increase in overall product thickness. From what I understand, the company offers a handful of the same devices with different hinge tensions. They provide a free exchange program if the one sent to you does not work. By default, you are sent a medium strength device but there is also a low strength and high strength device available. Edge sharpness. One noticeable change with the new PS model is the smoothness of the edges of the tray. 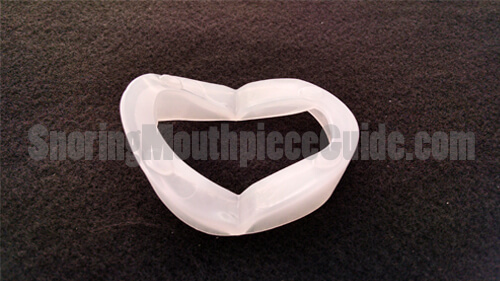 With a thicker material, the manufacturer was able to create edges that are more rounded and easier on the gums. The original product is constructed of a thinner material, making it difficult to round off the edges. Unnecessary pieces removed. The new design removed unnecessary parts of the device. For instance, the original had an outer and inner wall on both the upper and lower trays. Due to the nature of how all mandibular advancement device work, it’s not necessary to have an inner upper tray or an outer lower tray. When in use the outer upper tray is being pulled in while the lower tray is being pushed out. Breathing spacers. The original device did not have a feature which prevents your mouth from completely closing. For mouth breathers, this is an important feature. The PS model was introduced with 4 small posts, two on the upper tray and two corresponding posts on the lower tray. 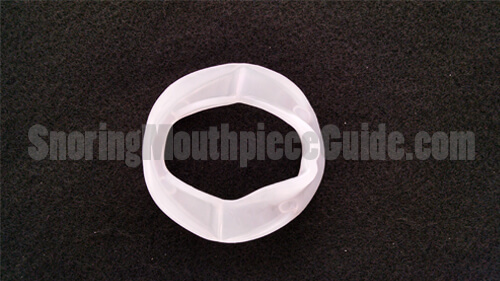 These posts prevent the mouthpiece from completely closing and leave about 1/8″ air gap between the two trays. Area of pressure. Perhaps one of the greatest improvements to the original Snoremender has to do with how the device uses the teeth as leverage points to hold the lower jaw forward. With the original device, most of the outward pressure is applied to the smaller lower front teeth which are generally weaker compared to larger most rear teeth. Also, the pressure is applied mostly to the top of the teeth. If you understand how leverage works, it’s easy to see how a tremendous amount of pressure applied far away the fulcrum (in this case where the tooth roots into the gum) can really stress these small lower front teeth. The new device corrects this issue by focusing the pressure on the stronger more inner teeth. It also refocuses the pressure on the base of the tooth and not the top by changing the angle of the lower tray contact point. Take a look at the image below. Most of the outward force is focused on the teeth shaded in purple and less on the yellow and green colored teeth. I tried both devices for a total of 7 days, alternating every other night between the two. I will go ahead and cut to the chase and tell you that they both did, in fact, stop my snoring. That being said, I present an explanation of my experience using each device including the initial modifications, overall fit, and effectiveness. The manufacturer claims that their product works “out of the box” and while this may be true for some, I did have to slightly modify each one prior to use. I found the original device to have unbearably sharp edges. Using a nail file, I dulled the edges so that they were blunter. This seemed to make it less irritating to the gums. Thankfully, this issue was corrected with the PS model. With the PS model, I had issues with the lower tray popping off of my teeth. I easily corrected this issue by heating the lower tray in 158° water for 1.5 minutes and then holding it in my mouth for 2 minutes. I used a thermometer, however, the manufacturer suggest a temperature range between 150° and 170° which can be achieved by mixing 1 cup cold water with 2 cups boiling hot water. Using this method does not require the use of a thermometer. Both devices fit in my mouth and didn’t fall out. However, the PS provided a closer and more comfortable fit overall. The original device does not take the different sizes of each tooth into consideration and the PS does. Both devices effectively controlled my snoring. As far as this aspect, one did not outperform the other. What are the actual users saying? Overall, those who have purchased this particular oral appliance have been satisfied with their decision. Some do report mouth soreness that lasts for several days. Others report excessive drooling while sleeping. These are typical complaints commonly cited by users of other mouthpieces. Minor tweaking can be achieved by heating and pulling on the material. This is a different approach than the commonly found “boil and bite” types that are available. Some users found the adjustment process to be somewhat challenging. Others were able to use it right out of the box without any adjustments. Whether or not it will work out of the box for you greatly depends on your mouth structure. Some have used this device in an attempt to help with sleep apnea and have had moderate success. However, using it to treat such a medical condition without proper diagnosis or doctor supervision is not advisable. According to Aetna, MAD’s help in some cases to prevent airway collapse while other times a continuous positive airway pressure machine is necessary. This product is one of the few out there being offered with free shipping. There is no denying that this device has several positive qualities along with a few negative ones. In the industry of over-the-counter anti-snoring devices, it is certainly no newcomer with a 6-year history in the UK and USA. The design offers innovation, simplicity, durability, and adjustability. All four of these attributes are not commonly found in one product. The device itself is small and compact, making it less bulky and intrusive in ones’ mouth. In addition, the simple design makes cleaning a breeze and ensures that all the nasties do not colonize. Having clinical information to support their claims in addition to an AADSM member of their design team helps tremendously with credibility. In addition, the Pressure Shift Technology helps to set this product apart from its competitors. While some user complaints have surfaced, many of these are not exclusive to the Snoremender PS and are found in other similar products. 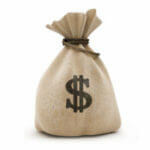 The cost savings of purchasing multiple devices gives it the competitive advantage over similar products. If you are interested in purchasing multiple units (for instance, one for you and one for your partner) this product may offer a better value. Overall, this is a unique product that has so far stood the test of time. While the price is in the mid to high range, it is comparably priced to others in its class. It is, in fact, a simple yet effective device that delivers as promised. Because of this, I recommend giving it a try. If you are interested in the Snoremender, you may also want to check out a very similar product that I recommend called the Zquiet. This product is very similar in nature, FDA approved and made in the USA. It was also developed by a dentist by the name of Avery Lieberman who has more than 20 years experience in sleep medicine. Next post: Review of the Original SnoreDoc – Does it work?